Geiranger in Norway is both the name of a fjord and the name of the small tourist village that nestles between the mountains at the fjord’s head. The area has been listed as a UNESCO World Heritage Site, and features some of the most spectacular scenery in the world; as a result it’s the must-visit destination of hundreds of thousands of tourists each year. But there’s a problem, and that’s the nearby Åkerneset mountain, because at some point it will erode to the extent that a significant portion of it will collapse into the fjord and send a devastating eighty metre tsunami towards Geiranger. Simply put: the village will be flattened. Against this background, the magnificently named Roar Uthaug and screenwriters Harald Rosenløw-Eeg and John Kåre Raake have fashioned that most unlikely of movies: a Norwegian disaster movie. 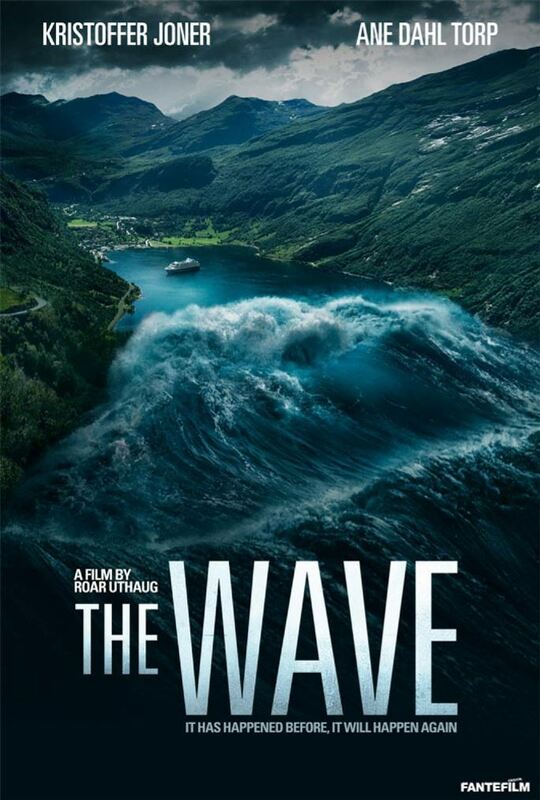 But unlikely is as unlikely does, and The Wave is grounded by the fact that this type of event has happened elsewhere in Norway in the past (and the movie opens with a recap of these tragedies). Where movies like San Andreas (2015) try to impress with the size of the devastation on display, The Wave keeps it simple, and is so much better for it. Focusing on geologist/mountain whisperer Kristian (Joner) and his family – wife/hotel receptionist Idun (Torp), teenage son/skateboarder Sondre (Oftebro), and cute young moppet Julia (Haagenrud-Sande) – the movie opens with Kristian on the verge of leaving Geiranger and the geologist’s facility where he works, and moving to the “big city”. But in classic movie fashion he senses that all is not well on Åkerneset, and instead of taking himself and his kids to the airport, he abandons them at the facility’s car park in order to go check out his hunch – which of course proves to be deadly accurate. But also in classic movie fashion, his colleagues, led by doubtful Arvid (Såheim), in a performance guaranteed to make viewers think of Charles Hallahan’s similarly unimpressed/stupid geologist in Dante’s Peak (1997), say they’ll keep an eye on things and that Kristian shouldn’t worry. Stuck in Geiranger until the next day, Kristian drops Sondre off at the hotel where Idun works, while he and Julia spend one last night in their old home. Sondre heads off to skateboard in the basement levels with his earbuds in, and without telling anyone. With the mountain making the kind of noises that practically scream “Evacuate right now!”, Arvid and colleague Jacob (Berning) rapel down into a crevice in order to check their recording equipment, and find themselves right smack in the middle of the mountain’s decision to give up keeping it together. Before anyone can say “What was that noise?”, an eighty metre high tsunami is heading for Geiranger, and the clock is ticking: if everyone wants to get to safety, they’ve only got ten minutes to get there. At this point the special effects kick in, and very good they are too (the tsunami’s merciless, unstoppable rush toward the hotel is one of 2015’s most indelible images). With ten minutes proving too little time for everyone to save themselves, Kristian himself barely survives, while Julia at least is kept safe with a neighbour. Idun and Sondre find themselves holed up in the hotel’s bomb shelter with guest Phillip (Larsen) as the water level rises. What follows is the kind of race-against-time search and rescue mission these kind of movies thrive on, with Idun and Sondre facing more threats to their survival than would seem logically possible, and Kristian conveniently being in the right place at the right time to discover their whereabouts. Hackneyed scripting aside, there’s tension aplenty in this “second half”, and the cast gamely play it straight, which adds to the edge-of-the-seat atmosphere that Uthaug creates (even if the viewer is certain it’ll all turn out okay in the end). One of the strengths of this scenario is that the family is one you can actually root for; for once they’re a family who clearly like each other and aren’t dysfunctional (it’s certainly more credible than Dwayne Johnson’s macho need to save his daughter in that other disaster movie). It’s also here that Uthaug uses his budget wisely, mixing vast swathes of destruction with more intimate location work and achieving a convincing fit with both. And there’s a decision made involving Phillip that hints at the script maybe having a darker edge in an earlier draft. 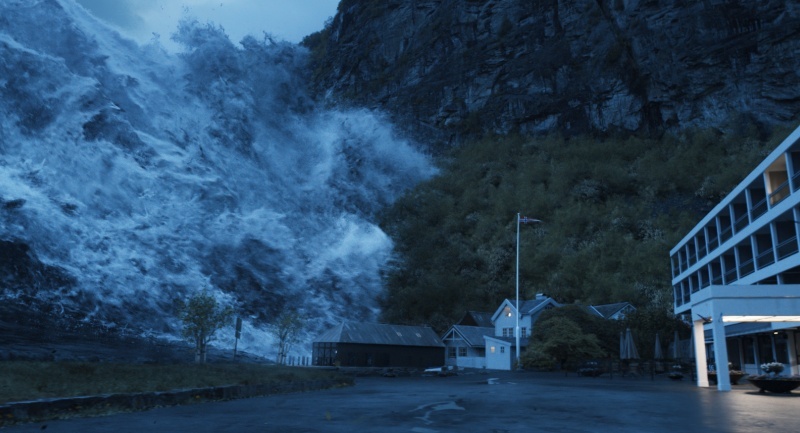 The Wave has been a massive hit in Norway, with almost a fifth of the country’s population having seen it on the big screen. Despite the subject matter – hey, let’s show what could happen when one of our mountains collapses – and its real life consequences, and not forgetting that the movie was actually shot in Geiranger, by keeping the heroics to a minimum, and dialling back on any potential histrionics, Uthaug and his cast and crew have made an effective, exciting thriller that surpasses expectations. Rating: 8/10 – comprised of three distinct acts – “I think we should run”, “I hate it when I’m right”, and “I’d say I told you so but I have to go save my family first” – The Wave has a great deal of heart amid all the death and destruction, and never lets its more predictable elements get in the way of telling a good story; surprisingly gritty, and with a great deal of charm, it’s no wonder the movie’s been chosen as Norway’s Best Foreign Language Film entry at next year’s Oscars.